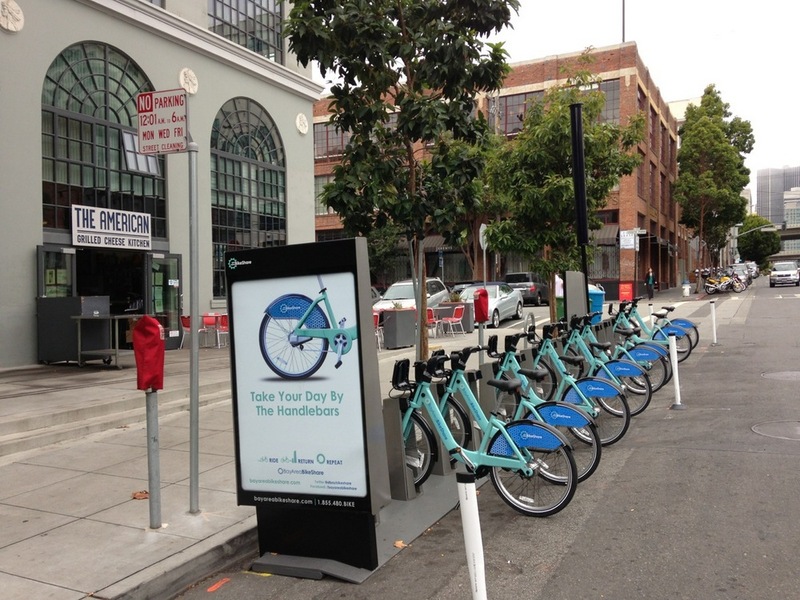 This is it, folks: Bay Area Bike Share officially has a fleet in place for tomorrow’s launch. I know it’s tempting, but please refrain from trying to take the bikes out for a ride prematurely. wait, so can I not try to ride a bike today? Will it not let me take one out? The station at Market and Front has already been tagged. People tag trees and rock formations in public parks in this town. What’s your point? Yes – the city has finally been begrimed! of this key tag, or vice-versa. Merely observing how soon after they were installed that they were defaced. I am super excited. I am taking a day off tomorrow to check out the ceremony. With the bike-shares, bicycling is one step closer to becoming mainstream. Great idea. I wonder if somebody is looking into using the Clipper card for bike share. anyone know what time tomorrow will you be able to use the bikes? 12:01am? 6am? not until the launch events are over? It would probably take a decade and a billion dollars to get that accomplished. Don’t think it would work, at least not without modification of Alta’s station design. I would require a reader at each bike dock or a single reader at the kiosk and issuing a key code. Which one will you tag next? Bike share key activated – member #54 ready to go tomorrow! Trees and rocks, more bad ideas. All part of Agenda 21, no doubt. I may not be a bike fan, but I certainly don’t like seeing the public space get defaced by taggers.